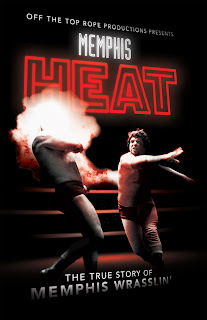 ----My review of Memphis Heat. ----In August of 1978, I never knew that when I first stepped into the Blytheville, AR American Legion to watch “rasslin” with my mom and the neighbor kids that it would still influence my life to this day as I write a column on rasslinriotonline.com. It was a Friday night and the tradition of the Tramel family was that Dad went out with his brothers and friends to hit the local bar. Mom and I would find something to do and we usually didn’t really talk to Dad again until Sunday or Monday morning. Yeah, he would be there, but drinking on Friday night along with Saturday night was more important to him than anything we were doing. As the neighbor gathered her boys up to go to Blytheville that night, Mom made up her mind that she was going to do something for a change and take me along. The first match of Wayne Farris as “The Kisser” scared the crap out of me, but by the end of the night when Jerry “The King” Lawler wrestled John Louie in the main event, I was hooked!! ----From that point on I did everything I could do to make sure that after a morning of cartoons, I watched Memphis Wrestling every Saturday morning at 11:00 AM. Mom always wanted to go shopping on Saturday morning, so she would finally pry me away around Noon. I usually missed the final 30 minutes of the show, but it really never featured anything big. Well, one Monday morning when I went back to school, I was told the Nightmares or the Assassins had had their masks removed. Oh me!! The horror!! I missed it!! From then on, I did my best to arrange to stay at least until 12:15 to watch until they were going into the “expiration of time” match. ----The Tramel family later moved into the country, and that was a bad thing for me. We had this really bad antenna that was stuck picking up only one channel, and that channel was not channel 5! I would go out and rotate it until my mom would yell, “Stop..you got it!” and would watch Jerry Lawler against Jimmy Valiant or Bill Dundee through the snowy TV screen. I was lucky enough to make friends with a couple of guys [Michael Williams & Steve Griggs] that loved wrestling as much as I did that also lived in the country. They had better antennas, and I could watch it full color with no snow. When my one friend [Griggs] would go on vacation, his family would leave me a key, so I wouldn’t miss my weekly fix. ----As I got older, I got to go to different events at the Mid-South Coliseum and to the TV taping in Memphis. My friends, Lynn Pearson and Doug Brown, joined me on more than one occasion. I would later get “in the know” and start taking photos and writing in magazine and fanzines. When the VCR became popular I would trade Memphis Wrestling with a guy in Bay City, MI [Ric Davies], and when they got cheaper, I could actually make copies of the show and trade it with others. I formed a friendship with an older guy [Bill Nichols] that I would never have if it wasn’t for wrestling. I would watch the show with him when I came home from college – it was fun to watch him and his mom who I felt were two of the last believers in the world. ----Jerry Jarrett was featured in parts of the film that made you realize just how smart and important he was to the history of this area. His simple booking of good guy vs bad guy, and making the feud mean something, is used to this day every weekend at the local shows. Pivoting points of the business in this area were well documented: Monroe/Wicks feud, Fargo/Lawler feud, Sam Bass’ death, Valiant coming in to feud with Lawler, the debut of Bill Dundee, Lawler breaking his leg, the Lawler/Kaufman feud and the movie portrayed the end of Memphis Wrestling to be at the point that Jimmy Hart left. Was that really the end?? The show did continue, but that was the point that Vince McMahon changed the business and killed the territories. ---- Sherman Willmott, Ron Hall and Chad Schaffler should all be commended on a job well done. The film brought back memories of my childhood and helped tell many stories behind the angles. The first few moments of every Memphis show started with the two “naked guys” going around in a circle. That clip made me realize how much I miss that show. And when they showed the Mid-South Coliseum empty, it was really sad to think that building will never see wrestling again. If you are a long time fan – go and watch this movie for history and to relive your childhood. If you are a new fan and think that wrestling is Steve Austin and The Rock, then open your eyes – long before that there was Lawler, Dundee, Wicks, Hart, Valiant and Sputnik Monroe.